There is a tendency in the world of Metal to try to overload every available inch of sonic space with brutality. It’s an understandable and often effective approach, but at times, bands who utilize a more stripped-down strategy are equally capable of blowing the listener’s mind and ears. 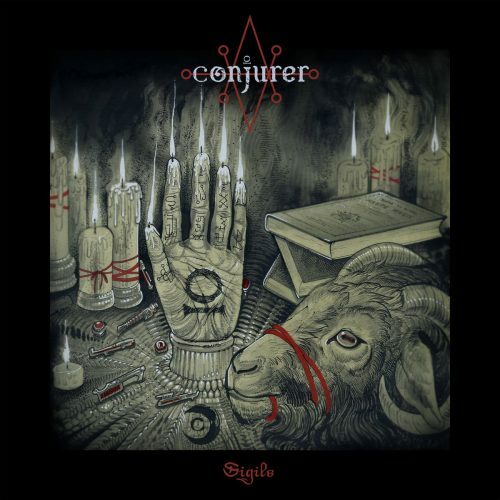 It is this kind of sense of refinement that is evident in spades on the new album Sigils by Indianapolis-based Sludge/Doom quintet Conjurer. For anyone familiar with their debut, Old World Ritual, their latest is not a radical departure from the sound they established there, but is a logical and powerful step forward. “Will of the Hag” opens the album with a swell of organ and a simple, slow drumbeat and bass riff, and for a moment, they are content to just let it ride. The feel is sparse but simultaneously epic, like waves eating away at the beach at night. When the guitars join in, they don’t change the mood but reinforce the lumbering heaviness already present. And then the vocals kick in and the full weight of the music really slams into place. Vocalist Dustin Mendel provides the narrative thrust behind the band. It’s not that the rest of the group isn’t stellar, they certainly are, but the vocals tie everything together. 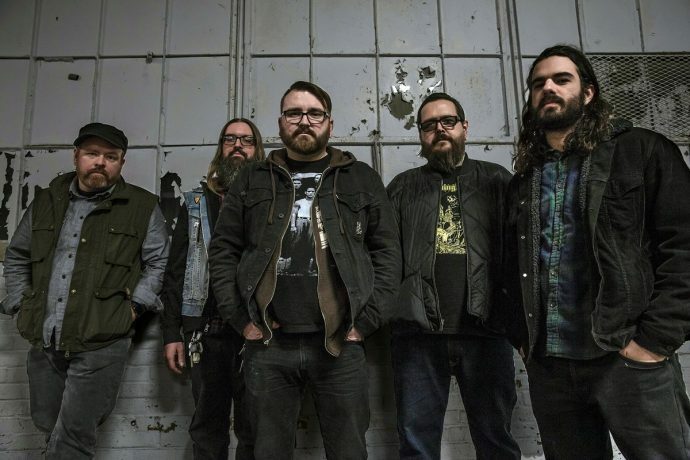 The Doom/Sludge assault peaks with a chorus that is both crushing and catchy. “Darkness. Devour. Life.” indeed. Conjurer don’t just dwell in the murky slow-tempo. On the second track, “Rusted Crown”, they spend some time rocking an effective Post-Punk swagger, while “Incantate” is full of plenty of swinging drum work, while avoiding any Stoner Doom pitfalls. And here we debut the track “Across the Void”, a mammoth slab of hypnotic Doom. From the opening moment, Mendel intones his barbarous evocations like some divine beast that cannot choose between existing as a sorcerer or a cosmic warlord. Later in the track, they kick the listener’s ears in with one of the most driving riffs on the record, yet pair it with a huge wash of organ which keeps the mood intact. And that epic atmosphere rides out through the rest of the song. Conjurer’s greatest strength, though, is the overall architecture of their sound. As they maneuver from one section to the next, every instrument has its proper place. The spare organ work always provides the perfect atmosphere, and the bass picks up the monolithic feel of the material, especially when the dynamics drop lower. The riffs are glacially heavy, yet the guitars never cry out for attention. Instead, they are there to be discovered. It is a search worth undertaking. Sigils is due out on April 5th and it is not to be missed. It’s an album that needs several listens to absorb the subtle nuances and to enjoy the craftsmanship put into the songwriting process. But from the start, prepare to be crushed, not under the great weight of Earth, but in the vacuum of space. This is the best kind of aural punishment, one for both the mind and body alike. Below you’ll find streams of two more tracks from the album and info about how to get it.